Are charters overrated? The public says yes! More on that in a moment. The recent Intelligence Squared debate has resulted in a variety of new and important conversations. Via phone calls, social media DMs, and emails I have received quite a bit of feedback from folks that are for and against privately-controlled school choice. I also accepted a challenge from Chris (Citizen) Stewart to debate him Cambridge-style this evening. You can watch here free tonight at 6 pm PST on the Sacramento State Doctorate in Educational Leadership Facebook page via Facebook LIVE. More recently, I received an invite to debate Mike Petrilli and Shayne Evans in Chicago with Macke Raymond (CREDO) moderating. I am still searching for a suitable debate partner before I accept that invitation. Btw, I am still interested in debating the DFER’s Shavar Jefferies. He agreed, then changed his mind. In the post Charter Schools Are Overrated @IQ2US I gave you a heads up about the “Charters are overrated” debate that was held in New York City and sponsored by Intelligence Squared. 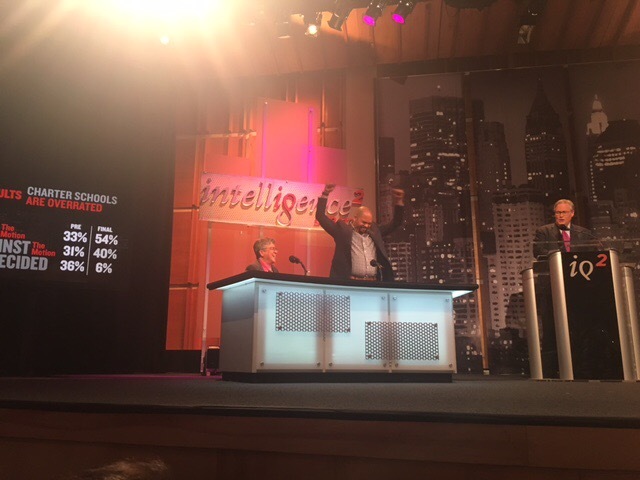 Intelligence Squared @IQ2US is a “nonpartisan, nonprofit organization that was founded in 2006 to restore civility, reasoned analysis, and constructive public discourse to today’s often biased media landscape.” They host discussions grounded in facts and informed by reasoned analysis and are syndicated on NPR nationally. Well the debate has come and gone and (spoiler alert)… we won! At the start of the debate, the audience voted on the motion (Charters are overrated) The audience was split basically in thirds (For, against, undecided). After the debate, we were fortunate to move about 20% of the audience to supporting the motion. You can see the final vote on the screen in the photo below. I have pasted my remarks as planned below, but not necessarily as delivered. I have also pasted the syndicated NPR version and a link to listen on iTunes. Many brilliant minds have debated from this stage. So I recognize and appreciate that it is a privilege for me to stand before you today. I would like to thank and honor my family and those who have educated me for this opportunity. Gary began our debate by arguing that charter schools have evolved and departed from their original intent. I’d like to build upon this principle argument. Let me begin by telling you a little bit about my approach that will compliment Gary’s remarks. There are now thousands of charter schools. While some are awful and many are average, some of them great. So you are not going to hear us say tonight that every charter school is a problem. Just as you’re not going to hear Jeanne and Gerard say that every charter is perfect, you won’t hear us say that charters are completely imperfect. Even so, you will hear us say that charters are overrated and ask you to embrace the idea that charter schools are in need of reform. I’d like to first begin with the problem. The system of public education in the United States includes some places that are excelling and some that are struggling. Overall, the United States performs in the middle of the pack in many international comparisons. However, there are some states that are knocking it out the park when compared with countries internationally. For example, in Math and Science, only four countries perform better than Massachusetts. Only five countries perform better than New York and New Jersey. In fact, the NAEP test – the so-called National Report Card — shows us that the kids of today are smarter than they ever been and our nation’s graduation rates are at an all-time high. Our public education system deserves credit for making this happen. We’ve made real progress. The key problem is the inequality between states, districts AND within schools and districts. In fact, Gerard and Jeanne have been very eloquent on this point over the years. Inequality as the status quo for poor children is really the shame of the United States. This is probably an area where we agree. Some have suggested that charters resolve the inequities that persist in American society and are a civil rights remedy. Donald Trump and his Secretary of Education Betsy Devos have said that school choice is the civil rights issue of our time and have promised to commit 20 billion dollars to the approach. Gerard, as Trump’s presidential transition team lead on education, has made this point. Jeanne has also defended Betsy Devos’ for-profit charters in Michigan as a civil rights remedy. In contrast, as noted recently by civil rights groups such as the NAACP, Journey for Justice and the Movement for Black Lives, charter schools are far from a civil rights remedy. Overall, their results mirror, and in many cases underperform, the public schools that Jeanne and Gerard have consistently denounced as “failing.” In fact, in some important ways – by using approaches that limit or deny access to some of our most vulnerable students — many charter schools undermine civil rights causes. Next I’ll take up the proposition that charters are a slam dunk for student academic achievement. There are many wild claims out there about charter school performance. Many of them are rooted in a set of studies produced over the years by CREDO, a conservative think tank. Even though CREDO studies are not peer reviewed— which means they can conduct studies without integrating independent external input and quality controls. Despite this, charter schools point to CREDO’s 2015 urban charter study to say that African American and Latino students have more success in charter schools. Leaving aside the integrity of the study, what charter proponents don’t mention is that the performance impact is .008 SD’s and .05 SD’s for Latinos and African Americans in charter schools, respectively. These numbers are larger than zero, but you need a magnifying glass to see them. Contrast that outcome with policies such as pre-K and class size reduction which are far more unequivocal measures of success than charter schools. They have 400% to 1000% more statistical impact than charters. Thus, the performance of charter schools, on average, is overrated. And again, these are the BEST possible national results for charter supporters to point to. Our friends have previously discussed the right of parents to have access to high-quality schools. In fact, we agree on this point. However, as I have discussed extensively on my blog Cloaking Inequity, in states where charters are unregulated, a decade of peer reviewed research literature has demonstrated that charters have the freedom to implement a variety of exclusionary policies to select their students. In California, for example, the ACLU found that at least 1/5 of all charters had policies in writing on their website that were using the exclusionary approaches such as requiring parents to commit to volunteer hours or volunteer payments in order for a student to be enrolled. Researchers at the University of Colorado have also identified a dozen additional ways that charters can shape their enrollment—everything from pushing kids out through multiple suspensions to advertising aimed at favored groups to counseling out students with special needs. In essence, if charters are allowed to implement exclusionary policies and are not held accountable, they do the choosing instead of families. Furthermore, the charter industry will often point to waiting lists, but examinations of these lists have found them unreliable due to duplications and self-reporting. In fact, I have personally received calls from being on a charter school waiting list many years after my interest had waned. or that there aren’t any charter schools that are excellent. So I submit to you, voting that charters schools are currently overrated will simply demonstrate that you are aware that charter schools are an education reform that needs more work. Unfortunately, in most forums the conversations about charter schools is often reduced to simple sloganeering. So, thank you to our opponents, the moderator and the audience for engaging in a substantive discussion. If you would have asked me ten years ago to participate in this debate about charter schools, I probably would have been sitting at the other table this evening. I am a former charter school educator, parent, board member, donor and volunteer. I first became involved with charter schools when I volunteered in a Minnesota charter schools in the 1990s, not long after the first implementation in that state. Fast forward to the mid-2000s and I worked as a 21st Century program instructor, essentially a teacher’s aid, in a Bay Area charter school in California. I have also donated to a Bay Area charter school— in fact, they still send me fundraising letters. I also served on the board and was a parent at a Texas charter school. But, I am a scholar. We are convinced by evidence. It is our sacred duty to society. So my perspective on charter schools changed when I began to research them and engage with the data BEYOND those with which I had direct and personal experience. So I submit to you that we allow ourselves the space in our national discussions about charter schools— and for this debate… to change our mind. We have talked this evening about many of points in the debate about charter schools, but there is one major point of agreement: Poor students in the United States have less opportunity for a high quality education than students living in wealthy areas. So we must NOT, MUST NOT, do nothing… because African Americans, Latinos and other poor students continue to be underserved in our society on purpose. But the motion tonight is about whether charter schools, as an education reform, are overrated. Considering the evidence, I proffer the audience should embrace the motion and vote that charters schools are a reform that needs reform. or listen here on iTunes. Ps. 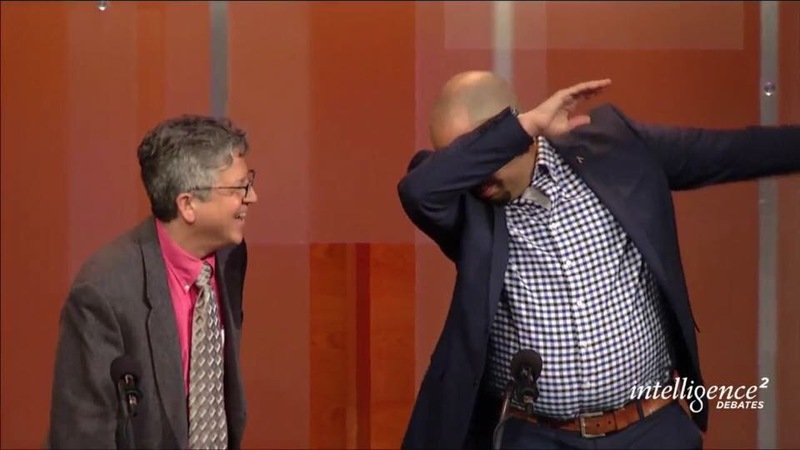 My first dab ever after the audience voted in our favor. I am a school librarian for the Dallas Independent School in Dallas, TX. We have roughly 130,000 students district wide. Unless Charter School proponents can guarantee enough quality Charter Schools will open to accommodate all of the 130,000 students wishing to attend a Charter, it is NOT a choice. Unless there are enough quality Charters willing to provide transportation for our students, regardless of the fact they are not REQUIRED to – NOT A CHOICE. If a Charter School picks only the smartest children to attend – NOT A CHOICE. The Dallas Independent School District is being set up to fail by the proponents of Charter Schools. If the State of Texas truly cared about our kids, they would REINSTATE PREVIOUS FUNDING FORMULAS – not cut funding, and funnel what little money we were getting, to Charter Schools. If Charter Schools are so wonderful, then why are there no Charters in Frisco, Mesquite and numerous other suburbs? Why? Because those districts choose to fund their schools, and treat their staff with respect. They have not subscribed to the idea that constant churn, and creating misery and stress to force good teachers out to avoid paying higher salaries, is good business. So, school choice is not a choice unless every child has the opportunity to attend a quality Charter. No. It will be more akin to the “Left Behind” series, remember that? Certain people make it to heaven, and others are trapped in a burned out shell of a school trying desperately to survive.